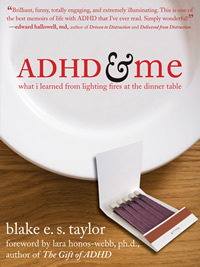 《ADHD & Me: what i learned from lighting fires at the dinner table》 . 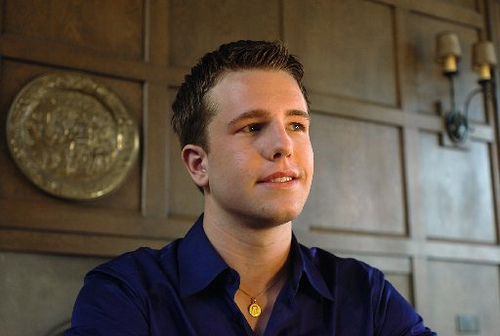 ADHD & ME, written by an UC Berkeley student named Blake E. S. Taylor. This book I see as an autobiography with many hints and advice on how to properly deal with ADHD & ADD. I'm so amazed at how clear Blake is in describing his childhood memories. A 5 year-old experience containing very thorough detail as if he recalled it happened a minute ago. Reading through ADHD & ME, some of the behaviors & feelings given by Blake I can relate to myself. Every person is different but Blake states a broad & general point of view of an ADHD’s mind that can be used by a parent or anyone else to get a good idea or sense of understanding in order to help a young ADHD individual. Not only do the story event are similar to my past (added with a few changes), but also the tips to manage the situations. The “hows” Blake states for you to help an ADHD individual are familiar to me and several of them has already been used or can still be used all by myself, on my own. The stories and situations followed by advice & solutions and with other sources that you can use, I recommend that you look into it. Don't just hog the book for yourself though; share ADHD & ME together with the young ADHD child you wish to help. Easy to read, the vocabulary & grammar isn't difficult, and a simple format to follow while taking notes or marking things down. Again, I highly recommend that ADHD & ME be the first place you will look. A basic point to start a direction into a harder & difficult pathway for you aid towards an ADHD individual.